I was sick yesterday seeing him fall off the back but talk about amazing! What he did today was something I've never seen before, he really came back from the dead! It was a truly incredible ride by Landis. A god indeed. 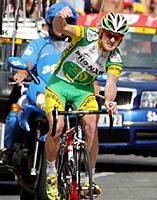 Just after this stage I picked up a May 2006 issue of VeloNews in which there was a letter to the editor poking fun at Alex Vinokourov for being unpredictable. The funny quote was something to the effect of, "The peloton let him go because no one has ever come back from a five minute deficit." I hope VeloNews provides some context to this accomplishment, particularly given the results on Saturday.